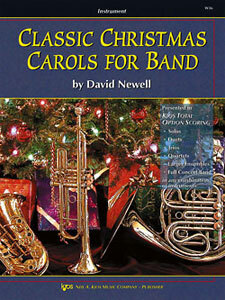 Classic Christmas Carols for Band is a collection of 15 of the most popular and treasured Christmas Carols of all time. Perfect for holiday concerts, this book can be used by the full band, or as solos, duets, trios, quartets, and larger ensembles in any combination of instruments. Presented in the Kjos Total Option Scoring format, each part book contains all 4 choral voice parts written in the playable range of each instrument, allowing for unlimited flexibility!